The Good Food Co. | Aesthetics Over Health? Aesthetics Over Health? Is Looking Good More Important Than Feeling Good? Think about the most recent goal that you have made for yourself in relation to your fitness. Was it an internal goal or an external goal? I find, more often than not, most individuals have goals that are directly related to their looks. They pay no mind to their internal health. Have our aesthetics become such a large area of focus that we completely set our health on the back burner? Is it possible to make both internal and external goals that work with one another, and even help the progression of each other? I find this scenario to be most prevalent within the bodybuilding community. 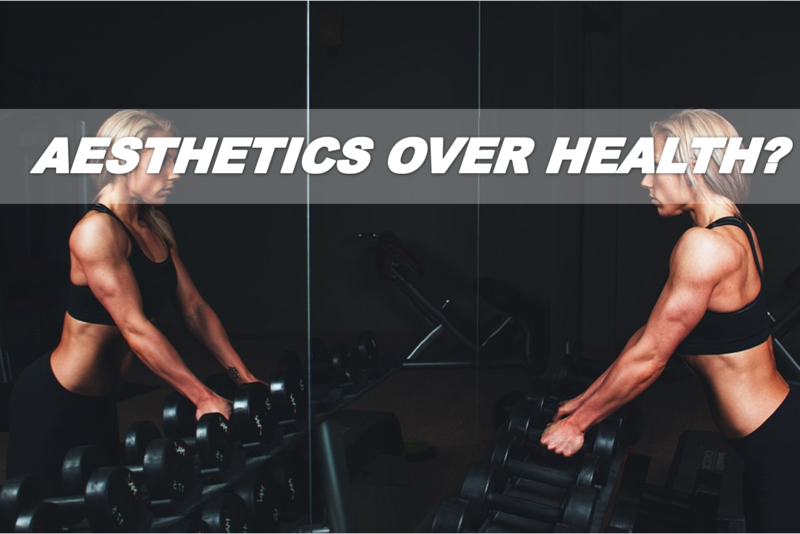 Although, with social media booming and images of “dream fitness bodies” being every other post you see, the general population is falling into the “aesthetics over health” sector as well. Pushing our bodies to the absolute limits. Achieving a body fat percentage that challenges our biological functions can cause damage to many systems within our bodies including productive, digestive, circulatory and endocrine system. If you knew that achieving this goal could potentially cause dysfunction within these systems, would you stay on course with achieving said goal? I say, keep the goal but make sure it’s about more than just Aesthetics. In creating health and fitness goals, having an aesthetic body is great but don’t lose sight of other goals that should be a part of your aesthetic goal. The list could go on. These are just a few to mention, that all will help to achieve your aesthetic goal as well. Scheduling appointments for a routine physical, comprehensive blood work panel, and even a physical fitness test are all great ways to create your current overall health baseline. There are many programs out there designed to achieve aesthetic goals, but they may hinder progression in the above health areas. Be sure to check in on your baseline throughout your program. Just as you would your weight loss or body fat percentage, checking your overall health baseline is just as important if not more. When we actually do put internal health first, the appealing aesthetics we may desire will follow. To think that if we actually take care of our bodies from the inside out, that we may just be able to achieve those strong limbs and flat tummies. Our bodies are smarter than you think. When we do not feed it well, it will not perform as well. When we do not rest enough, it will not repair efficiently. When we shock it and do crazy deprivation diets and loads of cardio to it, it will rebel and teach you a lesson. So don’t complicate it. Treat your body right, learn what works for your body type and begin to achieve results that will actually last a lifetime. Are aesthetic and health goals able to coincide with one another? 100% yes! A bigger question is: Are you able to truly look at your said fitness goals from all angles and take each part of yourself into consideration when setting, establishing a program and achieving your goals? It will take some work and you’ll have to be patient, but your body and mind will thank you for the rest of your life.